A total of 3,794 Kindergarten through eighth grade students participated in 33,481 garden-based learning hours during the school day at 9 schools. This curriculum is tied to Next Generation Science Standards. 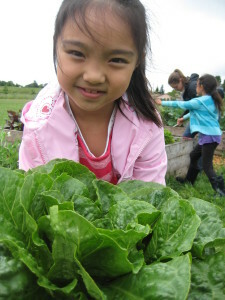 394 elementary aged students participated in after-school and summer Youth Grow garden clubs and camps for a total of 5414 learning hours dedicated to hands-on food gardening activities. 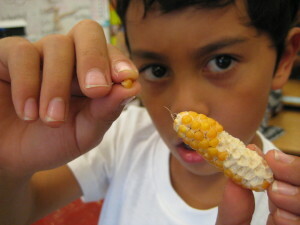 63% of Garden Club students report an increase in number of vegetables “liked” as reported on a “veggie vote” survey. 100% of participating teachers reported increased their level of garden based education with students in comparison to the previous school year. 2,198 children and 2,114 adults participated in events learning about healthy cooking, snacking and eating and food gardening. Over 100 volunteers donated 1000 total hours assisting with after-school Youth Grow clubs, garden maintenance and more. 133 classroom teachers collaborated with our Garden Educators to take their students out to the garden. 8 teachers participated in our Garden Based Professional Learning Community, bringing integrated garden education to 272 students. 28 people graduated from our School Garden Coordinator Certificate Training in 2017, receiving 35 hours of training.